An old ballot box sits on the floor of the large function room on the second floor of the Bar Harbor municipal building on Cottage Street on Tuesday. 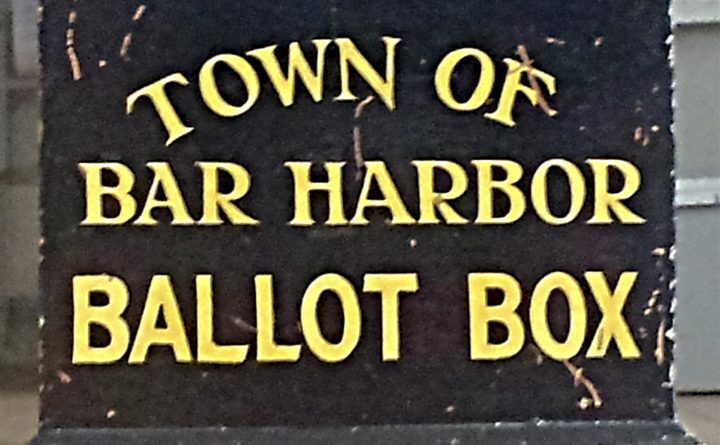 Bar Harbor voters on Tuesday decided to create a charter commission to consider possible changes to how their town’s municipal government is organized. The proposal was approved with 1,624 votes in favor and 937 votes opposed. According to a copy of the town’s sample ballot, among the options that might be considered by the commission are the “consideration of electronic voting at town meeting, streamlining the budget [development] process, and the purpose, function and structure of the Warrant Committee.” The town’s 22-member Warrant Committee considers and makes recommendations on each question that is presented to local voters at Bar Harbor’s regular and special town meetings. Voters also elected six people to serve on the commission: Joseph Cough, Michael Gurtler, Patricia Samuel, Martha Searchfield, Peter St. Germain and Christopher Strout. Of the seven commission candidates listed on the ballot, Joey Engling received the fewest votes and did not win a seat on the board. He received 1,160 votes. Local voters overwhelmingly approved a question on the municipal ballot about changing the zoning of a Route 3 property where Downeast Horizons has its operations building. By a 2,352-281 vote, they authorized putting the entire 4-acre property in the Town Hill rural zoning district. The property had been split between two zones — rural and residential — and by changing the zoning to place the entire parcel in the rural district, the organization can expand on the lot. The operations building has been grandfathered in the residential zone, where it is not allowed to expand, town officials have said. Downeast Horizons is a nonprofit organization that provides support services to people with developmental disabilities.